1) President Obama promised that the cost of insurance would go down “by $2,500 per family per year” or "by up to $2,500 per family per year." Here is the promise made over 20 times during just his 2008 presidential campaign. 4) "If you like your health care plan, you'll be able to keep your health care plan." He made this claim publicly at least 37 times in speeches. 5) That Obamacare will create jobs. In October, 2011, Gallup reported: "Forty-seven percent of American adults currently report that they have a gun in their home or elsewhere on their property. This is up from 41% a year ago and is the highest Gallup has recorded since 1993, albeit marginally above the 44% and 45% highs seen during that period." 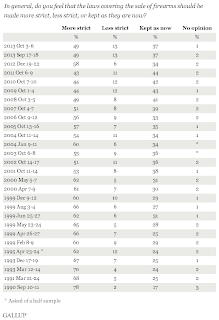 The Gallup data on gun ownership since 1991 was provided in this graph from Gallup. OK, but here is the big puzzle. Gallup has apparently redone its survey data on gun ownership rates, shifting down gun ownership rates. The shift hasn't just occurred in recent years, but goes all the way back to at least 1991 and the drop seems to be by two percentage points in each survey. 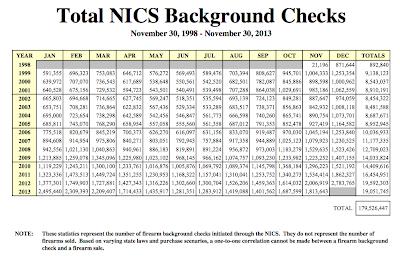 This data shows that gun ownership is about the same as it was in 1983 and 1996. The old numbers showed 47 percent owning guns in 2011. Now the new numbers is supposedly 45 percent. For 2010, it used to be 41 percent. Now it is 39 percent. The 2009 number used to be 42 percent. Now it is 40 percent. This goes all the way back. The 1991 number used to be 50 percent. Now it is claimed to be 48 percent. The dates match up exactly and the survey questions are the same, so it isn't just that these results are from different surveys. 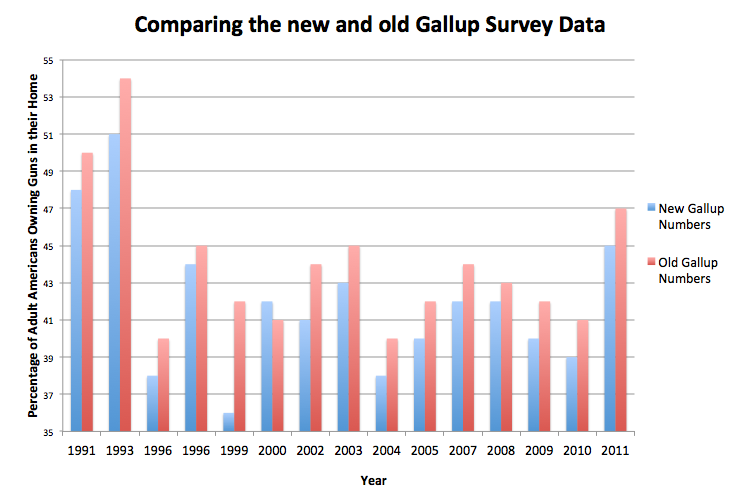 This rewriting of past survey data is not trivial. 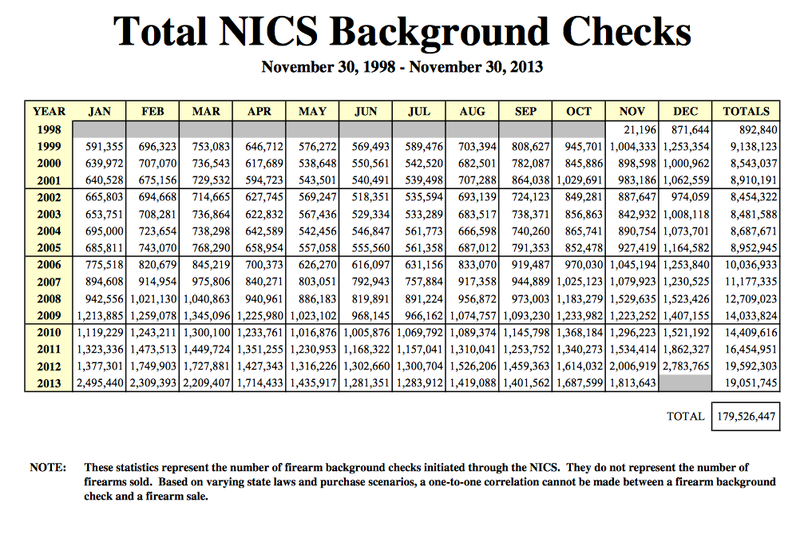 In 2011, that change implies 4.8 million fewer adult gun owners (the census information is from here). The puzzle gets even more bizarre when one looks at other survey data. If there was a re-weighting that Gallup thought was more appropriate, it should have impacted other surveys that they did. Yet that isn't the case. Given that the October 2011 and earlier gun survey data was changed, I decided to look at the approval rating data for the 2011. 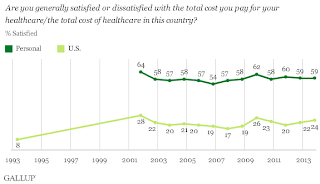 For example, here are the survey data on whether people are generally satisfied with the total cost of healthcare in the US. The most recently reported data is available here. 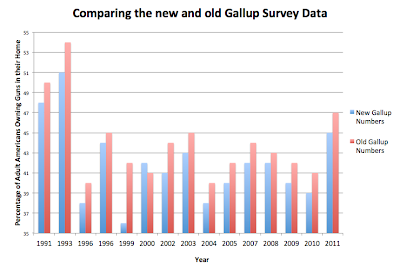 Here is a survey discussion of the same data from 2009. This line is exactly the same as the lower line shown above. As another example, take the weekly survey data for the presidential approval rates from January to November 2011. It is identical whether one looks at the recent reports of that time period or the data as it was reported in 2011. The most recently reported data is shown here. The original data is shown here. 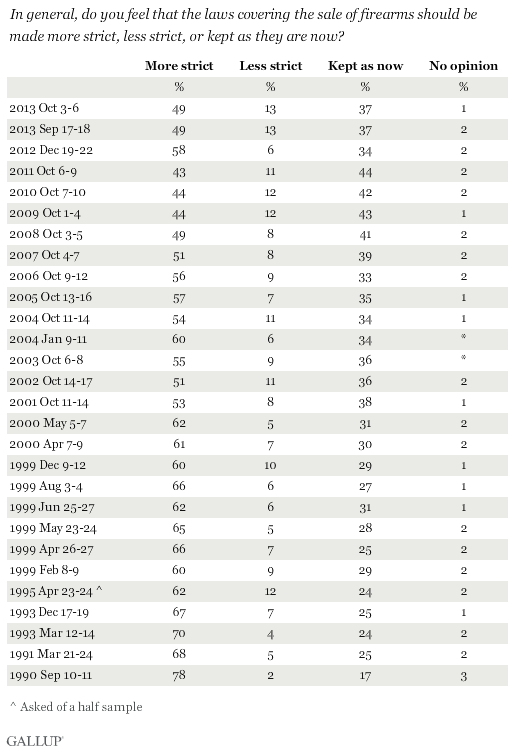 Here is a screen shot of the 2011 Gallup report on changes in gun ownership over time. Click on figure to make it larger. 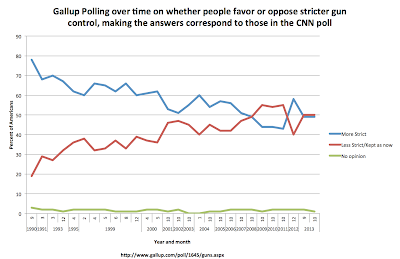 The latest Gallup and CNN polls both show the exact same favor and opposition to more gun control (50% oppose / 49% favor). 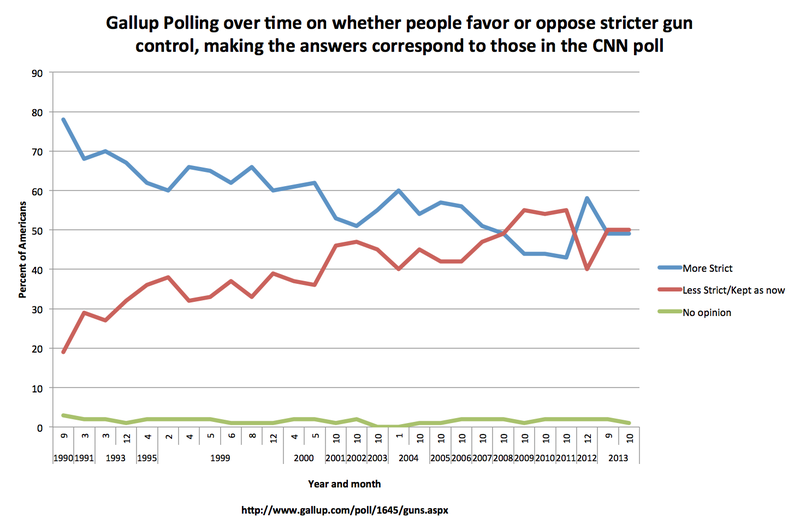 The CNN polls shows a record level of opposition to more gun control. 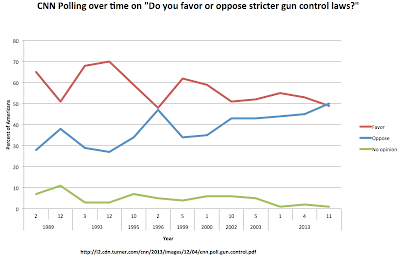 The Gallup poll numbers aren't a record high, but they do show a general trend towards opposition and that all the poll values of 50 percent or more opposing more gun control occurring since 2009. The Gallup numbers are as follows. The notion that Obama has been doing a great job of overseeing how the government is running is pretty funny given that he is consistently not taking responsibility for everything from IRSgate, APgate, Benghazi, EPAgate, NSAgate, and Sebelius shaking down the companies that she regulates for donations. On so many of these issues he says that he only discovers problems from reading about them in the press. Yet, in an interview with Chris Matthews on Thursday, Obama argues that the problems with lack of oversight in managing Obamacare are unique and aren't symptomatic of his administration generally. Of course, for years, Obama tends to blame everyone but himself for things that have gone wrong. Here is a video of Matthews' interview and the relevant part of the transcript. Chris Matthews (at 22:07): . . . there should have been a CEO assigned by you, personally with unique personal responsibility to oversee the rollout of healthcare and there wasn't. When Secretary Sebelius appeared in that hearing and she was asked by Marsha Blackburn, who's in charge, it took awhile for her to answer. And she finally got to the Chief Operating Officer of CMS, the Center for Medicaid and Medicare, and it didn't seem like there was a strong top-down authority system from you. Did you have, do you have that? Let's look forward here. Do you have a relationship with your cabinet? Do you have a system of cracking the whip? They follow through and they execute as you envision they should or do you work through a COO, like Mr. McDonough? What is your system for management? Obama: Well, first of all I think it's important to distinguish between this particular project, this healthcare project, where it is obvious that we needed additional controls in place, because it didn't deliver on time the way we wanted. And how we've managed incredibly complex problems for the last five years. Everything from wars to pandemics to, you know, natural disasters to, you know, expanding student loans for young peoples. Generally speaking, my theory has been, number one, that yes, I've got a strong Chief of Staff but I'm holding every cabinet member accountable and I want to have strong interactions with them, directly. Number two, is I have an open door policy where I want people bringing me bad news on time so we can fix things. And, that you know, the challenge, I think, that we have going forward is not so much my personal management style or particular issues around White House organization. It actually has to do with what I referred to earlier which is we had these big agencies, some of which are outdated. Some of which are not designed properly. We've got, for example, 16 different agencies that have some responsibility to help businesses, large and small, in all kinds of ways. Whether it's helping to finance them, helping them to export. And so if you're a small business person getting started, you may think you need to go to the Small Business Administration on one thing, you've got to go Commerce on another. So, we've proposed let's consolidate a bunch of that stuff. The challenge we've got is that that requires a law to pass. And frankly, there are a lot of members of Congress who are chairman of a particular committee and they don't want necessarily consolidations where they would lose jurisdiction over certain aspects of certain policies. But this is going to be a major focus and has been over the last five years, but going forward over the next three years, how do we have a 21st century federal government? And this is part of the reason why people are skeptical. There are just some things people have an interaction with the federal government where we could be doing a much better job. “Dumbing Down the Courts: How Politics Keeps the Smartest Judges Off the Bench” (2013) is the most recent of Dr. John Lott Jr.’s excellent books applying economics to better understand the societal dynamics around controversial issues. Gun owners will be most familiar with his past work on the defensive uses of force by lawfully armed citizens (“More Guns, Less Crime”). In “Dumbing Down the Courts” Dr. Lott examines how political forces are increasingly driving the federal courts to be staffed by judges (and justices) who are less intellectually capable than their predecessors. In short, his hypothesis — supported by data on more than 1,500 federal court nominees — is that the smarter, more respected (by their legal peers), and more academically talented a candidate for a federal court, the longer the confirmation process and the less likely confirmation will be successful. Indeed, this reality has become so widely accepted on an anecdotal level that many of the most promising candidates for federal judgeships simply decline to accept even consideration for such an appointment. Dr. Lott uses rigorously analyzed data to move this discussion beyond mere anecdote. . . . 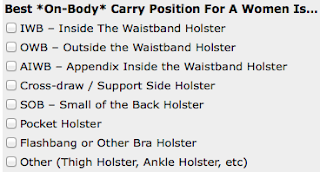 The change in your pockets is lining the TSA's, well, pockets. The Washington Post shares the results of the TSA's 2012 fiscal report, which shows that it made off with a record $531,395.22 in change that travelers forgot to collect from security bins. (From 2008 through 2011, the total was closer to $400,000.) The biggest take occurred at Miami International, where TSA workers collected $39,613; it's one of 13 airports where the annual haul was at least $10,000. . . .
You might think that support for stricter gun control would be relatively high these days. After all, gun control groups and Democrats frequently claim that is the case. Bloomberg's millions might also be making a difference. But that is not the case. 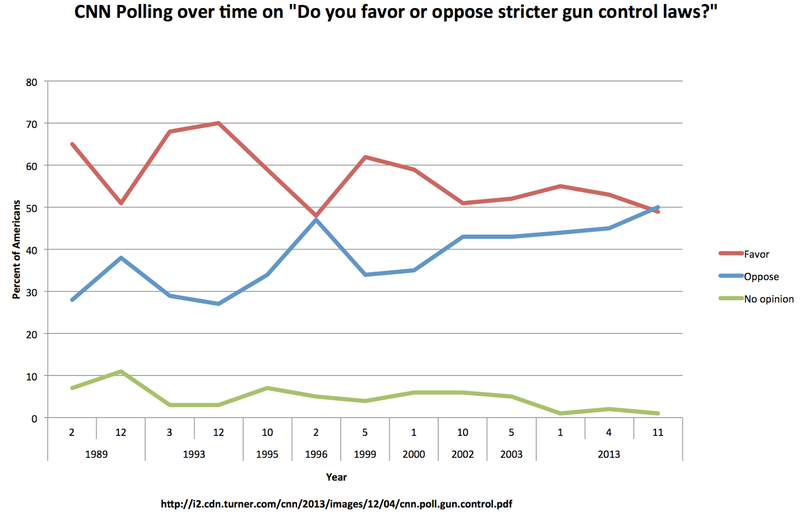 From CNN, 50% of Americans oppose stricter gun control. The previous high opposition was 47% in February 1996. The average opposition was 38%, so the current opposition is 12% higher than the average. Where is the best place for a woman to carry a gun? A survey is being given here. It will be interesting to see what people pick. The options are shown in this screen shot. Maybe this student watched the Hunger Games? : "Fifth-Grader Suspended for 'Shooting' Imaginary 'Arrow' at Classmate"
"We all want to keep the schools safe, but I'd far prefer to see something credible done about actual threats, rather than this ongoing, senseless targeting of imaginary horseplay," said Rutherford Institute President John W. Whitehead. . . .
Click on figure to make larger. Obama's approval rating has fallen 12 percentage points over the last year, but the drop in his support among some groups is larger than it is for others. 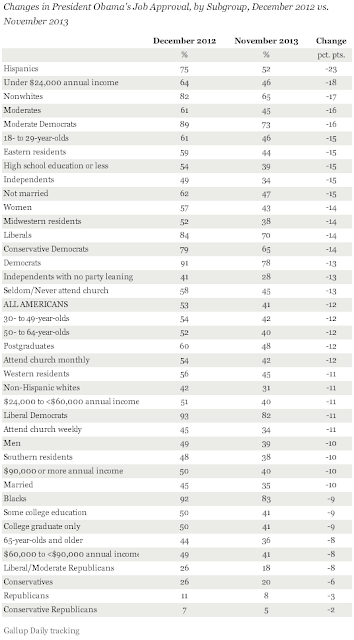 The original Gallup data is available here. Newest Fox News piece: "NFL hypocrisy -- Bloomberg anti-gun ads ok but ad about ‘protection’ is banned?" New York City Mayor and gun control advocate Michael Bloomberg sure knows how to get his way. This week the NFL, after featuring anti-gun ads during the last two Super Bowls, it decided that an ad offering the opposite point of view in the upcoming Super Bowl XLVIII on February 2 was just too much. The NFL turned down an ad from a company called "Daniel Defense" which sells guns and outdoor gear that discussed "personal protection and fundamental rights." It featured a former Marine talking his family's safety, noting that he is ultimately responsible for their protection. Unlike Bloomberg’s ads, the "Daniel Defense" ad never even mentions the word "gun," just the concept of personal protection. The very end of the initial version of the ad did show the company's logo, a picture of a gun. But this wasn't the stumbling block, as the company told the NFL that it would happily to remove the logo and replace it with a picture of an American flag. Still the NFL found that unacceptable. . . .
Politico says that renewing the plastic gun ban is a "small gain" for gun control efforts. I actually think that gun control advocates are making gains, but not in terms of the issues that this piece at Politico is looking at. The article in Politico is entitled: "Gun control efforts must settle for small gains." The Republican House version of the bill, which would renew the law with no additional provisions, passed the chamber on a voice vote Tuesday afternoon — meaning no roll call was taken to provide a list of who had supported or opposed the measure. But the Democratic-controlled Senate is where things get complicated. . . .
New York Sen. Chuck Schumer, the No. 3 Democratic leader, will likely attempt on Monday to pass a more comprehensive bill, one that requires a piece of metal to be permanently attached to guns to prevent them from becoming undetectable by removing their metallic parts. Republicans are expected to object to Schumer’s move, meaning he wouldn’t be able to secure a vote before the current law expires. The Democratic strategy appears to be a messaging effort to push the GOP to articulate its opposition. Ultimately, the Senate is expected to just swallow the House version. . . . I have already put up a post on the NFL rejecting a pro-defensive gun use ad. Some are now arguing that getting rejected has actually been good for the Daniel Defense ad because that has generated so much more media coverage. But Bloomberg's ads had the best of both worlds: getting on the Super Bowl and also getting a lot of very favorable news coverage. I couldn't find any news stories saying something bad about the Bloomberg ads. Here are some comments from the 2013 ad. Note that none of these publications have anything so far about the Daniel Defense ad being turned down. A gun control group founded by New York City Mayor Michael Bloomberg aired an advertisement during the Super Bowl calling for background checks. The 30-second spot by Mayors Against Illegal Guns aired in the Washington area at the end of halftime of the game between the Baltimore Ravens and San Francisco 49ers. The ad calls on lawmakers to pass rules requiring background checks on guns. It is narrated by children, with "America the Beautiful" playing in the background. . . .
Five children and one grown-up appear in “It’s Time,” a Super Bowl ad bought by Mayors Against Illegal Guns, a group that has behind it more than eight hundred mayors and the personal money of Mike Bloomberg of New York. The children are playing and smiling and posing in front of an American flag. The grown-up—Wayne LaPierre, executive vice-president of the N.R.A.—is seen in a video from 1999, testifying that he has no problem with closing the loophole that allows allows unlicensed dealers to sell guns to anyone they like, with no background checks at all. He does now: at a Senate Judiciary Committee hearing on gun violence, LaPierre said having all gun buyers go through background checks would create a “universal federal nightmare.” . . . This is a more frank act of lobbying than the cheerful ad the group ran last February, when the Giants were playing the Patriots and Bloomberg and Thomas Menino, the mayor of Boston, sat next to each other in jerseys and talked about how they might disagree about bagels and the Red Sox but were at one in support of the Second Amendment—with some limits. And it wasn’t a general evocation of tragedy, like having children from Newtown sing “America the Beautiful” with Jennifer Hudson. Bloomberg seems to have decided that this moment is less about supplicating or pretending there’s no real discord, and more about getting a bill through Congress. That will involve putting cracks in the N.R.A.’s defenses. . . .
Because of the high-profile spot the Super Bowl affords it, the ad is perhaps the most significant gun-control push from Bloomberg's group, Mayors Against Illegal Guns. . . .
Other news stories include Slate, the Daily Caller, and other stories that I am not going to take the time to list. "We are looking at a world in which anyone with a little bit of cash can bring an undetectable gun that can fire multiple bullets anywhere — including planes, government buildings, sporting events and schools," Schumer said. "3-D printers are a miraculous technology that have the potential to revolutionize manufacturing, but we need to make sure they are not being used to make deadly, undetectable weapons." . . .
“This is an extremely serious problem,” Holder said in a statement. “This is a very worrisome threat to law enforcement and to people who fly every day. We can’t have guns legally in circulation that are not detectable by metal detectors.” . . . Currently, X-ray machines used in many federal facilities can detect 3D weapons, unless they are broken down into component parts, in which case it may be up to security officials to recognize the individual components of the weapon. "Not every place you go to is like the airport," Griffith said. "A lot of places, [like] courthouses, all they have are metal detectors." . . .
Computer World has this about how dangerous the plastic gun is to those who use them. Last week, the Bureau of Alcohol, Tobacco, Firearms and Explosives (ATF) published videos demonstrating how some plastic models of the Liberator were able to fire up to eight rounds, while others exploded on the first round; the success of the weapon depended on the polymers and printers used. . . .
A truly all-plastic firearm “would be very unreliable and very unsafe,” according to Larry Keane, senior vice president of the National Shooting Sports Foundation, a trade group representing gun manufacturers that’s allied with the National Rifle Association. . . .
Police Commissioner Andrew Scipione called a press conference today after the NSW [Australia] Police Force concluded its experiments with 3D printable weapons, including The Liberator. The boffins over at the NSW Police bought themselves a 3D printer for $1700 and decided to test how easy it would be to build their own gun. They downloaded the blueprints for The Liberator from the internet and printed out two weapons to test fire. All in all, they printed the 15 parts required to assemble The Liberator in 27 hours and assembled it within 60 seconds with a firing pin fashioned out of a steel nail. The two guns were test fired into a block of resin designed to simulate human muscle, and the first bullet penetrated the resin block up to 17 centimetres. NSW Police Ballistics division confirm that it would be a fatal wound if pointed at someone. What’s interesting about the second device they tested, however, was the “catastrophic failure” of the weapon. Translation? It exploded. The plastic gave way to the brutal force of an exploding .38 caliber bullet and the barrel exploded. . . . The law banning plastic guns is particularly useless because metal used in the gun to make it legal could be easily removed. Schumer said the Liberator's CAD blueprint allows for a piece of metal that can be easily removed and plays no functional role but renders the gun legal; bullets can be fired from the gun even though it is made entirely of plastic. . . . The Undetectable Firearms Act was passed in 1988, then renewed in 1998 and again in 2003. Here is something that I wrote about plastic guns back in 2003 and something about 3D printing earlier this year. To me the more important problem is the fact that metal guns that work identically to other manufactured guns can be made using 3D printers. Philadelphia is posed to ban 3D printed guns that aren't made by licensed gun makers. Other articles on the 3D plastic gun debate are here and here.
. . . The Gun Owners Action League (GOAL), which represents 16,000 members in Massachusetts and is the official state affiliate of the NRA, reports that many people applying for licenses have been experiencing long delays. Chapter 140, Section 131 of Massachusetts' General Law states, "The licensing authority shall, within 40 days from the date of application, either approve the application and issue the license or deny the application and notify the applicant of the reason for such denial in writing; provided, however, that no such license shall be issued unless the colonel has certified, in writing, that the information available to him does not indicate that the possession of a firearm or large capacity firearm by the applicant would be in violation of state or federal law." . . .
CHARLES KRAUTHAMMER: Well, I thought one of the most telling elements of all of this was the government's own report on the website improvement which it said that the website is now going to begin operating at a "private sector velocity," which was unbelievable in its irony. Here is an official government document, which is openly admitting that the private sector is infinitely superior to the public sector in doing stuff and it does this in a document which is trying to reassure us about an enterprise, Obamacare, which in fact is a de-privatization, a nationalization of the entire universe of American medicine, one-sixth of the economy. It makes you wonder if these guys even read their own stuff. The problem here is, number one, the capacity is quite low. 50,000 is a very small number. Amazon handles over a million an hour. And here if you go to 50,000, you end up like Peter Doocy where you have to wait five hours until you get in a queue, a lovely British word, meaning in an endless wait until the website is ready for you. Second is security. All the experts who were before Congress a couple of weeks ago have said it is utterly insecure and they wouldn't use it in the absence of security. All kinds of information is now vulnerable. And the third is what you mentioned, the backend. Which means all these people are shoving information into a system which is either reaching the insurers incorrectly, in which case there are going to be huge complications. It could take eons to actually undo the bad information or is not reaching the insurers at all. In which case somebody will show up January the 1st thinking he has insurance who doesn't and we're going to have all hell break loose.
. . . At least 37 states have increased spending on mental health in the year since Adam Lanza shot dead 20 children, six school employees and his mother in Newtown, Conn. It’s not just about money, either. States are experimenting with new — and sometimes controversial — ways to raise awareness about psychological distress, to make treatment more accessible for children and adults and to keep firearms away from those struggling with mental illness. . . . But overall, advocates say they are thrilled at the breadth and depth of the commitments from lawmakers of both parties. . . . The political advocacy group born from President Obama's reelection campaign is encouraging supporters to host "anniversary events" marking one year since the Newtown Elementary School shooting. Organizing for America (OFA) says it intends the events to be a "powerful reminder of what we lost a year ago, and a reminder that we as a nation need to do more to prevent gun violence and keep our communities safe." OFA says that the events will be held in towns and cities across the country and will be used to "call on Congress to finally take action to make our communities safer." . . . Some Republicans accused the president and his allies of exploiting the victims of the tragedy to build support for the bill. . . .
OFA held a similar round of events at the six month anniversary of the shooting. According to the group, more than 1,000 people attended nearly 80 vigils and remembrance events across the country. A letter posted online in the wee hours Monday by a former producer for China’s state television broadcaster starkly voiced in public the frustrations of a journalist working inside the country’s state-run media machinery. The letter was written by Wang Qinglei, a producer on well-known China Central Television news programs “24 Hours” and “Face to Face.” It was a response, Mr. Wang wrote, to being fired for having posted online criticisms of CCTV’s coverage of Charles Xue, a Chinese-American investor and prominent social media commentator arrested earlier this year in Beijing on charges of visiting prostitutes. Saying at the outset that he left CCTV on Nov. 27 after spending 10 years there, Mr. Wang described his disgust at the broadcaster’s reports on Mr. Xue and other influential microbloggers: “We abused the public institution of media to wantonly bombard an individual indiscretion. Journalistic integrity and professionalism were nowhere to be found.” . . . Elsewhere in the letter, Mr. Wang savages the propaganda system that censors news content. He contrasts CCTV’s shining new office tower and expanded global operations with what he says is the broadcaster’s declining reputation and influence – a trend he attributes to tightened controls. . . . But some say they are concerned that a political agenda might be driving China's choice of sites, its exclusion of foreign archaeologists and its relative lack of openness about its research. "There's this strong sense of nationalism that flows through the Chinese program," says Jeffrey L. Adams, an anthropologist at the University of Minnesota who has written about Chinese archaeology. . . . .
A copy of the audio is available here.
. . . It had been more than two months since a popular University of Michigan medical student was shot to death, and police seemingly had few leads. But on Oct. 3 — 45 miles from where student Paul DeWolf was killed in his Ann Arbor fraternity — a man in Detroit attempted to log onto a computer he’d just purchased through Craigslist. The man didn’t know it, but the Mac laptop had been stolen from DeWolf’s next-door neighbor around the time he was killed. That computer had an app that would lead police directly to it, and to the two suspects now charged in DeWolf’s killing. . . .
On Oct. 3, Apple was alerted that the stolen Apple Air computer was turned on, and its contents were erased. Police traced the computer to a home on Glynn Court in Detroit, and a man there said he got the computer from an Ypsilanti man through Craigslist. The new owner, a 30-year-old man who asked not to be identified, told the Free Press he’d suspected the laptop was stolen because when he connected to the Internet, the screen locked. But the man who sold him the computer tried to help him with the password, so, he said, he thought perhaps it was locked by an ex-girlfriend. “I knew it was something more than a stolen laptop since Ann Arbor police came all the way here,” he said. . . . Authorities took the computer and his cell phone, which he said he offered to help with the investigation. Police used it to identify the Ypsilanti man who sold the computer and learned that on July 25 — a day after DeWolf, 25, was discovered dead in his basement apartment — the Ypsilanti man bought the stolen computer from Jordan for $200. . . .
. . . 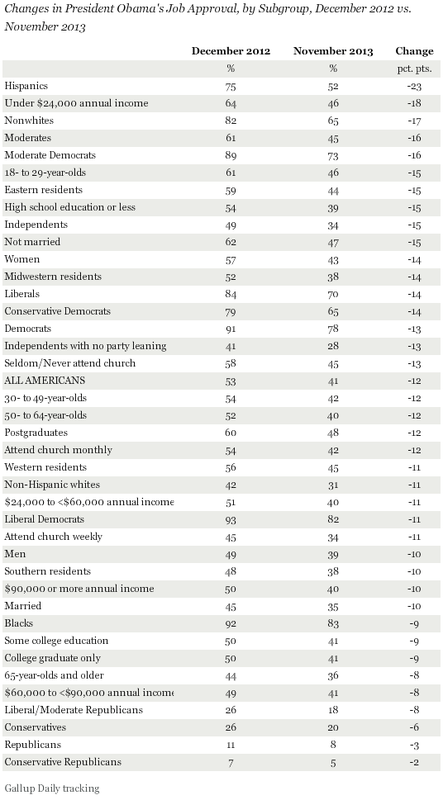 The approval numbers come from the annual 2013 St. Cloud State University Survey. A portion of the findings were released Wednesday. For President Barack Obama, 38 percent of respondents rated him as “excellent” or “pretty good,” with 61 percent scoring him “only fair” or “poor.” . . .